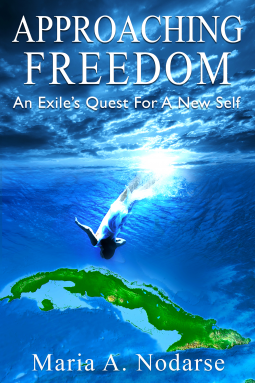 A probing tale of an exile’s quest for a new self, Approaching Freedom follows Maria Nodarse’s journey from her arrival as a Cuban political refugee in 1960s America to her return to her native land in 1979. Nodarse is fifteen when her family settles in a white, middle-class New Jersey town. In Cuba she had attended the same private American school since kindergarten. At Ridgefield Park High School her classmates ask her, “Did you wear shoes in Cuba?” When a fellow Cuban student joins her senior class she’s forbidden to speak to her in her own language on the school grounds. An outsider, she starts looking for somewhere to hide. Alone in this new reality, with one brother studying medicine in Mexico and the other imprisoned after the Bay of Pigs fiasco, Nodarse resents the role assigned to Cuban women. When her father loses his job and announces “We’re all moving to Miami.” Nodarse is not so sure. She has other ideas about her life even though it might cause her parents to stop talking to her. She knows that her decision will set the stage for the rest of her life. What she doesn’t know is how a headstrong young Latina can find her way through the maze of feminist, social, and political revolutions of the 60’ and 70’s without losing herself or the small family she has left. Also in Paperback; ISBN: 9781732892903 - $17.99 I'm the daughter of Cuban exiles who migrated to the United States in 1960 fleeing communism. After several years working as a bilingual secretary I obtained a scholarship to Columbia University’s School of General Studies in 1968 and was later admitted to Columbia University Graduate School of Journalism, earning a master’s degree in 1974. My student days at Columbia politicized me, and I embraced such liberal causes as the anti-war movement and the feminist revolution. My ideas and beliefs set me apart from mainstream Cuban exiles. While living in Manhattan I worked as a freelance editor, translator, and commercial writer. In 1979 I made a three-week trip to Cuba with a group of young left-wing exiles, after which I wrote an extensive article about my experience, a story that was picked up by two major American newspapers. Upon my return from Cuba I worked in sales for New York publishing houses and traveled extensively throughout Latin America. I also resided briefly in London and Madrid before returning to New York. I met my husband in Houston in 1988 and followed him to California. With an emergency teaching credential, I started working at a local elementary school teaching children of immigrant farm workers. I went on to obtain a bilingual cross-cultural teaching credential from California Lutheran University. I'm also a 2001 University of Santa Barbara Fellow and Teacher-Consultant of the South Coast Writing Project. I retired in 2008 in order to devote all my time to writing, and now live in Camarillo, CA, with my husband and our beloved KC Cavalier, Chloe.